This drawing is one of a series of unprecedentedly dynamic studies on the theme of the Virgin and Child with a cat. Here Leonardo works on a compositional arrangement with the theme of the cat wriggling free from the Child, who is held back by his mother. The composition is contained within a drawn frame with a round top, implying the intended format of a painting for which the drawing is a preparatory study. The shape of the frame is repeated in the shape of a round-topped window sketched to the right of the group, which indicates an interior setting - a device favoured by Leonardo in his early paintings of the Madonna and Child. 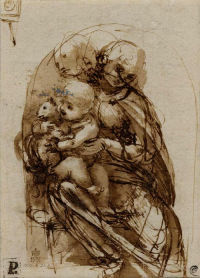 Leonardo’s handling of line is graceful and calligraphic, although areas have been heavily reworked, particularly in the lower half of the drawing where the artist has struggled to resolve the position of the legs of the Virgin in relation to the child and the animal. Leonardo seems to be aware of the limitations of line in terms of its ability to represent deep shadows. This becomes apparent in this study, where plasticity of form is as much a concern as the articulation of contours and the expression of movement of both figures and animal. On the verso, he reworked the entire group, adjusting the position of the head of the Virgin, and applying an ink wash in order to model the figures more three-dimensionally and unify the forms of the composition through light and shade.